Build your own collection of military diecast! You can mix and match between the tanks of the WWII or the fighter planes of legendary World War II! Only available on ModelSpace. 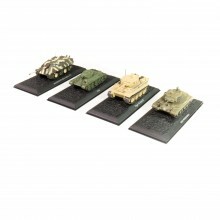 Whether you are fascinated by classic tanks or are left in awe by the wonder of warships and fighter planes, at ModelSpace our wide variety of military models will satisfy modelers and military enthusiasts. All of our military models exhibit incredible detail, bold colors and life-like features that replicate the real thing. Choosing one of our military model kits is not only a great way to build your scale model collection and perfect your modelling techniques but it will also teach you about the history of these powerful machines, the conflicts they underwent and the clever engineering that was involved in designing and building them. Take to the skies with military model aircrafts including iconic models like the spitfire – World War II’s most famous fighter plane. This fantastic model plane is made from high-quality material and even has functioning lights. 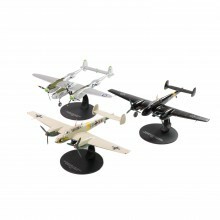 Exhibit your military model aircraft with pride by purchasing one of our display stands. Take your model ship collection to a whole new level when you discover our range of military model ships. Own a piece of maritime history with some of the world’s most renowned war vessels. Build a naval masterpiece like the IJN Akagi – one of Japan’s most famed battleships from World War II or journey back in time to the 17th century and build the San Felipe or HMS Surprise. These model ships are comprised of striking detail including dark hardwood and impressive sails. Building these iconic military model ships will allow you to improve your modelling skills as well as gaining a deeper insight into the history of these vessels. Take your scale model collection to a new level by adding something unique and captivating. Check out our military samurai model. A perfect representation of Japan’s renowned samurai warrior’s suit of armour. Dating back to over a thousand years ago this incredible military model is made up of fine details with each individual piece of armour carefully constructed to represent the real thing. Learn about Japanese military history while you enjoy building your samurai model piece by piece. Adding any of our military models to your collection is the ultimate way to learn about history while building impressive scale models that you can be proud of. Be sure to explore our other amazing models such as model trains, model cars and even our start wars collectibles range.